If you wish, you may put together a small group of women friends and family (18 years & older) to share the retreat experience, lodging, meals and transportation. This can be a wonderful bonding time and a cost-effective option. Be sure your group understands and can commit to solo time—it can often be a good way for beginners to learn about being quiet and inward and for everyone to learn about supporting each other’s inner Heart Journey. Discuss this with your friends/family and get clear about your intentions. Be aware that there may be some resistance, even for experienced retreaters, to moving out of your comfort zones. Acknowledging this, asking for support and moving beyond takes courage and is exceptionally rewarding. Remember that this is a spiritual practice in the same way meditation or a pilgrimage can be. We have a vacation rental company we’ve dealt with for many years and they represent several coastal homes in the area of our Heart Journey retreat. You can go on their website and see the following homes we recommend, mostly because they are within a few miles of where we will be meeting for most of our activities. Remember that our retreat will be on a holiday weekend, so make your reservations as soon as possible. For those who wish to put together a small group of friends/family, many of these homes have multiple bedrooms. There are also smaller cabins/cottages for those who wish to lodge solo. Make your reservations directly with Serenisea by calling 800/331-3836 or 707/884-3836. It should also be noted that Serenisea offers a 30% per night discount for the fourth and each succeeding night, if you wish to extend your stay. NOTE-PHONE SERVICE: Some homes/cabins may not have telephones and cell service is spotty in this area. Do your best to clear your schedule and minimize phone calls so you can be present on your retreat with few distractions. NOTE-LATE CHECK-OUT MONDAY: When you check-in at Serenisea, ask about a late check-out on Monday, if you wish. They will try to accommodate you if no one has reserved your house for Monday night. NOTE-LODGING: If you don’t find anything that works for you above, there is other lodging in the area and in the town of Gualala. You may certainly make your own arrangements; however, please do your best to be within a few miles of the little village of Anchor Bay. Gualala is okay too. Otherwise, during the retreat, you may eat in or dine out as you wish. There are several good restaurants in the area—to check it out on the web search: Gualala, CA Restaurants. Eating in: Many people choose to do something special about eating on retreat. Some fast, some eat vegetarian or vegan, some juice and some choose to allow themselves to “eat for pleasure” in ways they normally wouldn’t . . . the possibilities are endless and up to you. Although there are three good grocery stores in the immediate area, you will probably pay more than you do at home due to the isolation of the area. We usually do a little simple meal planning and bring most food from home. You can always fill in whatever you forgot locally. Most people will probably drive to the Coast and ride-sharing is recommended. This remote area is not easy to get to—that’s part of its charm. Make your travel a part of the retreat. If you’re sharing, discuss how you may wish to have some quiet time during the drive to help you turn inward so you can ponder your intention and prepare for the retreat experience. There’s no fast way to get there but this is the most direct: We recommend taking Highway 101North to Cloverdale (fill your fuel tank here), take Highway 128 toward Fort Bragg to Booneville, turn off 128 just past Booneville on to Mountain View Road. Take Mountain View all the way to the Coast and turn left on Highway One. 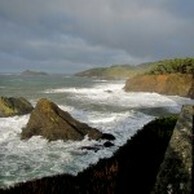 Take Highway One through Point Arena and continue south about 11 miles to Serenisea’s office. Pay attention to when you drive through the little village of Anchor Bay—Serenisea will be on the right about a tenth of a mile beyond Anchor Bay. There are few other transport options, and if you’re interested you can try the MTA and find out about the South Mendocino Coast Bus Service: www.4mta.org or call 800/696-4MTA. You can get a bus in Santa Rosa that stops in Gualala and Anchor Bay. For this option, though, you’d need to meet up with friends/family for transport after you arrive. Clothes: When packing clothing, consider the following: be comfortable, think about wearing things that feel good to you, express you, colors that resonate, jewelry that has meaning, play with it, if you wish. But don’t make it into another chore. Bring sturdy shoes for hiking, casual outdoor clothes. Bring rain gear—it’ll be winter and we may get to enjoy the tempests that come in from the sea. 1. Journal (for writing & sketching) you can buy a leather-bound fancy one or you can use any spiral bound notebook. Sometimes the fancy ones can be inhibiting! We urge anyone who registers to purchase this book and read it. If you can’t read the entire book before the retreat, at least read Intention on page 38, so you can get clear on your intention for the Heart Journey retreat. If you need help deciding on attending this retreat, read Courage on page 80, and to prepare for the Heart Journey retreat, read Retreating with Others on page 273. NOTE: There are many wonderful books on the subjects we’ll be covering. You will receive a Reading List handout from both of your guides during the retreat. 4. Art Supplies: bring any art supplies you wish for your personal time. Art supplies for the creativity workshops will be supplied as part of the retreat. We have arranged with three excellent massage therapists (listed below) to be available for bodywork during the Heart Journey retreat. We recommend you do this, if you can. If you choose to, you are encouraged to schedule your massage during the Solo Time slots in the retreat schedule with the exception of the 19th when Tara is getting married and the other two will be part of her wedding. When you phone, check their rates & locations/directions.